Fredrik Eriksson is one of Sweden’s most experienced chefs. With a growing up in rural surroundings south of Stockholm and with professional experience by the Swedish well-known chef Erik Lallerstedt, French top restaurants and own restaurants, Fredrik has developed a personal style where Swedish food traditions meet French cuisine. Over the years, Fredrik’s philosophy about food has been influenced more and more by health and green. 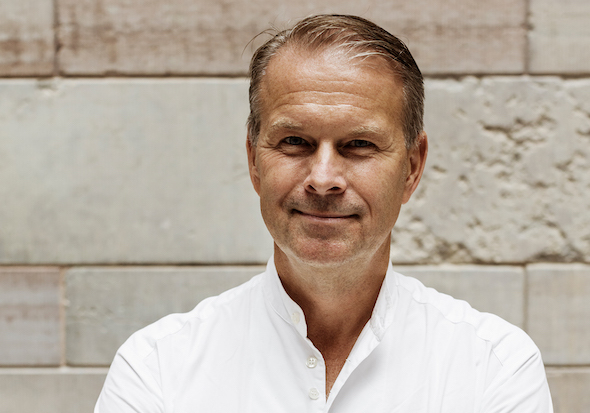 Today, Fredrik Eriksson runs two restaurants in Stockholm; Långbro Värdshus and Restaurant Nationalmuseum. Fredrik’s passion is to care about the Swedish food heritage and to create good food for everyone, and the journey towards the future chef’s profession began at home. Fredrik grew up with his family in Södermanland and spent all summer with his grandparents, who showed him everything from crayfishing to grafting apple trees. It was grandma’s raspberry bushes that were to be harvested on the correct day and vegetable land that was to be cleansed from weeds. It has given Fredrik a thorough knowledge of raw ingredients which he benefits from today. During the studies in the early 1980s, Fredrik Eriksson practiced and worked at the restaurant in the Stockholm City Hall and had the opportunity to take part in three Nobel dinners. Fredrik then began working with the distinguished Swedish chef Erik Lallerstedt (1983-1990). During this period, Fredrik Eriksson travels to France and makes international practice at world-renowned chef Roger Vergé and his restaurants Lámandier de Mougins (two stars in Guide Michelin) and Moulin de Mougins (three stars). During the 90’s, Fredrik Eriksson takes charged of the kitchen and meals at Fjäderholmarna’s restaurant. His cooking style is now characterized by Swedish cooking with elements of French cuisine and a great focus on fish and shellfish. The restaurant is located on an archipelago island in Stockholm’s inlet and is frequented by both stockholmers and international visitors. Today, Fredrik Eriksson and his team create beautiful and delicious meals, with great care for raw ingredients and food composition. Through Fredrik’s special ability to create an atmosphere around the whole meal, food and drink, guests are invited to a wonderful total experience. In addition to the food served in Eriksson’s own restaurants, the team creates meals elsewhere, often for a recognized Swedish business community. Fredrik is also a gastronomic adviser to the Nobel Foundation for the annual Nobel Dinner in Stockholm City Hall. He has also been honored to cook at great royal dinners. In connection with HRH Prince Carl-Philip and HRH Princess Sofia’s wedding in 2015, Fredrik Eriksson received the overall responsibility for creating the wedding dinner at the Royal Palace. Fredrik Eriksson has a strong willingness to contribute to the whole of Sweden’s gastronomic development. Some of his national efforts are counseling assignments for Sweden’s Minister for Rural Affairs, creative leader at the Restaurang Academy and member of Gastronomy Sweden, which is behind the country’s participation in the World Cup Bocuse D’Or. Fredrik is also committed to better food for children, something that is manifested through Fredrik Eriksson’s cooperation with local schools and other collaborations such as the Astrid Lindgren World in Vimmerby. Fredrik Eriksson’s great enthusiasm for sharing his food skills has been expressed in many cookbooks, and hundreds of cooking occasions in Swedish television for more than 20 years. The Nobel Prize Cookbook, which Fredrik co-authored, was named 2017 for the world’s best cookbook at the prestigious International Gourmand Awards.